Another photo here courtesy Norrie Mcnamee. Opened in November 1938 the Odeon was designed by the cinema chain's house architects Andrew Mather, and originally sat 1,819. The exterior was covered in cream faience tiles, later replaced by white render. In 1980, it was tripled to give 466, 224 and 310 seats. It closed in August 1999, and was quickly demolished for a car park. 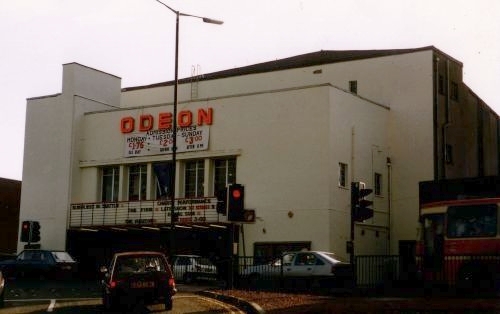 This was one of only 3 purpose-built circuit-style Odeon cinemas built in Scotland - the other two were at Motherwell (also now demolished) and Ayr (still open in 2006). Others Odeons had been planned for Bridgeton, Dumbarton, Falkirk, Partick, Springburn and Townhead, but these were never completed due to the start of the Second World War. A gallery of interior pictures from the early 1990s, post-tripling, is available here, courtesy Jim Duncan.